. 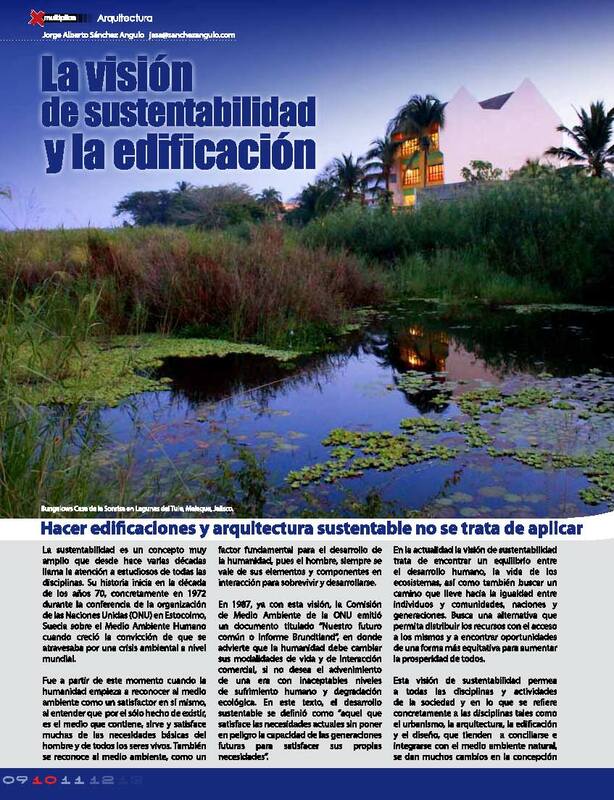 : LA VISION DE SUSTENTABILIDAD Y LA ARQUITECTURA. Publicacion en la Revista Multiplica. LA VISION DE SUSTENTABILIDAD Y LA ARQUITECTURA. Publicacion en la Revista Multiplica. Para leer este articulo dale doble clic a las iamgenes o pasa a la parte de abajo. THE SUSTAINABILITY AND THE ARCHITECTURE. ARTICLE PUBLISHED IN THE MULTIPLY JOURNAL # 62 / TOPIC: SUSTENTABILITY. CAMARA MEXICANA DE LA INDUSTRIA DE LA CONSTRUCCION JALISCO. The concept of sustainability is really wide and since a few decades it has caught the attention of experts in every discipline. The history of the sustainability started on the decade of the 70’s in 1972, during the conference of the UN in Stockholm about “The human environment”. At the conference they mentioned the world is passing through an environmental crisis. From that moment on, people started to realize that the environment was a satisfactor on itself, because of the fact that it exists, it contains, it serves and satisfies a lot of basic needs of people. The water, the air and the sun light are some of the elements that conform it and without those elements life could not exist on earth. The environment is also known as a fundamental factor for the development of the humanity, because men had always lived with these elements and components in interaction to survive and grow. In that way humans took advantage of the earth, the air, the rain and the wind to create the agriculture and to assure the supply. We have taken advantage of the energy of the nature to use them in our benefit. And also have used them like potential resource as raw material, available in different presentations, like wood, earth, metals, water, flora, fauna, etc.… All those facts have always served to build, to feed and to generate energy or products of daily use among other things. Years later in 1987 with this vision, the Commission of the environment of the UN issued a document called “Our common future” or “Brundtland report” where it states that the humanity should change their modalities of life and the way of commercial interaction, if they don’t want to pass through an era of suffering and ecologic degradation. On the report, the sustainability development was defined like “All that satisfies the current needs without putting in danger the capacity of future generations to satisfy their own needs. As it looks now, men were slow to understand their interdependence with the environment and up to today, humanity has serious problems adequating to satisfy the needs of a large population, which grows more and more, starting with a limited stock of natural resources, some of which are not renewable and irreplaceable today, besides being relatively scarce and having, literally, their days are counted and others that appear to be renewable and abundant, were neglected, destroying and polluting them without caring about their regeneration. So now it becomes necessary for men to take a new attitude and ecological morality, which would lead to a reappraisal of natural resources and environmental potential, which is: not to waste, no pollution, not damaging or destroying these resources. Instead it is: Conservative, caring, reproduce, promote regeneration and optimizing their use in satisfying their real needs, based on the idea that there is need for integration and respect for nature and the environment, overcoming consumerism and indiscriminate waste of resources. With this perspective, there have been many programs and projects to build new avenues and alternatives in order to address environmental problems and at the same time improve the use of natural resources for present and future. From this definition, exposed in 1987, the perception of sustainability has changed from a vision focused on the deterioration of the environment to a more comprehensive definition that includes many other aspects related to the quality of human life. Thus, the notions of sustainability developed in the years after the Brundtland Report,have included references to a hostof socioeconomic, political,technical, production, institutional and cultural factors that are related to the satisfaction of human needs. Today the vision of sustainability is to strike a balance between human development, life of ecosystems, as well as finding a path leading towards equality between individuals and communities, nations and generations. Finding an alternative for allocating resources by providing access to resources and opportunities for all in a more equitable and increase prosperity for all. This vision of sustainability has influenced to all disciplines and activities of society and in particular regarding to disciplines such as: urban planning, architecture, construction and design, which tend to be reconciled and integrated with the Natural Environment. Many changes are taking place in the conception of them, as these must now be seen as soft technologies, to be implemented from the conception of the design of settlements, buildings and technologies that impact in a less drastic way on the natural environment to counteract the adverse effects so far led to human settlements by the shape and attitude that have been designed without respect and consideration to other elements of the environment. The term of sustainable architecture has become fashionable and has been used in recent times to refer to what in past decades was called bioclimatic architecture, green architecture, environmental architecture, bio-architecture, "green architecture"and also called "Architecture environmentally conscious”. In reality, sustainable architecture is the most perfect model of the various architectural trends Bioenvironmental, as these moves are its fundament. Sustainable architecture contains all the background information of these trends and integrates them with a new comprehensive vision that represents the transformation impact the natural environment for men to intervene to make their buildings and to develop their life. This trend of modern design, serves the environmental impact involved in their own building in the environment through out its life cycle, systems designs and constructive systems and low-impact materials. Projecting consciously, that their life cycle, develop in a harmonious relationship and in accordance with their natural environment, making the bioclimatic variables studied from origin (the site and location of the land in relation to environment, the prevailing winds, the sunlight, temperature, relative humidity, water bodies, mountains, trees, etc.) to, wisely, solve the adverse conditions that they present and exploit their resources and potential to achieve the optimum conditions of comfort and convenience for users of it. In the search of self-sufficiency of buildings, sustainable architecture seeks the efficient use of energy and resources, implementing environmental technologies using renewable energies in the idea of achieving the minimum consumption and maximum use of energy. In this same line of respect and preservation of the environment, promotes the use of materials and supplies low impact, re-use and recycling of waste, the integration of waste to the natural environment, to end the cycle and prevent environmental pollution. The concept, in my opinion can be clear. But there are always several visions to solve a problem and this case is no exception. Currently, to sustainable architecture and design trends in fashion, we can find many projects and works carried out, but we can easily see that although they are raised under the same concept of respect and preservation of the environment, as the basic foundation there are several prevailing design positions. The first, which is an international-type current very showy and spectacular, which is the line that work the most developed countries and those with more economic resources, with "futuristic" concept design, based on a high technological development and a strong link with the so-called "intelligent buildings" and "HighTech ". This stream uses a wide range of new materials, systems and computerized devices and high technology in their quest to achieve comfort and energy efficiency.It often has been considered a Technologic vision that to achieve their fitness goals and environmental comfort, is not integrated in harmony with nature if not to submitor dominate based on high technological efficiency. The second is an architectural movement that tends toward the natural, not trying to dominate nature but harmoniously integrate with it. It has a more local or regional character and usually keeps a low profile. Its main base is the bioclimatic design.This trend is creating the best conditions of comfort, health and welfare of its occupants, through software design approaches and common sense, integrating architecture with nature, it takes into account issues and bio-climatic variables of their environment. It uses passive cooling systems, solar protection devices and some Ecotechnologies to take advantage of natural energies to achieve a good level of comfort and optimize energy expenditure. 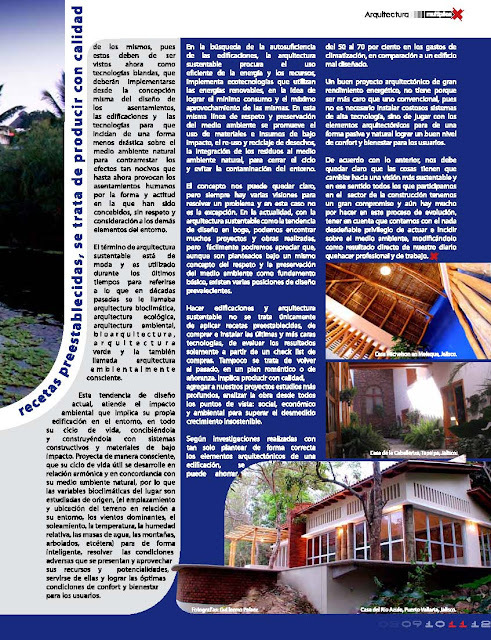 It has strong links with other eco-design trends and vernacular architecture. As it was already mentioned, although the two streams have the same starting point, on his way to address the problem they have very different roads and although there is a marked polarization between high-tech and natural, or vernacular, both sides have arguments and contributions to sustainability. So, it would be wiser to take the strengths of each of the positions and use them to seek the welfare and comfort, maximum energy efficiency, and thus preserve the environment and benefit the population. It is also important and necessary to take into account any confussion between the different logics that interviene in a different and particular way to determine the technology and designs. Defining two roads where many professionals or technicians have gone without knowing the original posture of Sustainable Architecture. First, is when the position of Sustainable Architecture ideology is moved by a vision that is based solely on a purely technical position, which only gives priority to the technical aspects and ignores the sociocultural context of the place where insert this new building and / or individual users who will use it. This is not to make the pattern really easy and simplistic "isolated", ignoring almost the total local conditions and becoming highly dependent on high technology and complex and expensive computer systems and mechanical facilities that are highly efficient but turn out to be large consumers, if not power, whether economic resources. Resulting into edifications that in the end of the day can become white elephants "unsustainable" or in the worst cases, their implementation "could not be sustained" from the economic point of view. The other major confusion, that frequently occurs is when the esthetic, symbolic or stylistic values that have been prefigured, especially in its external morphology, some buildings have been conducted under a strictly bioclimatic logic and have moved to this last and have been reduced to a mere pseudo-fashion, the only thing that lets us clearly stated, is the technical and theoretical vacuum which suffer these designers in relation to the original ideological conception of sustainable architecture. Making Buildings and Sustainable Architecture, is not only to apply preset recipes,purchase and install the latest and most expensive technologies, evaluate the results only from a shopping checklist. Nor is it back to the past, in a plan or romantic longing. Involves producing quality, add to our projects further study,analyze the work from all points of view: social, economic and environmental to overcome the excessive growth unsustainable. Dealing with the design and construction of sustainable architecture, involves giving a twist to conventional systems that have been using and it is indispensable to technological innovation,scientific technical development, creativity and many cultural changes. According to research, with just the right way to raise the architectural elements of a building can save 50 to 70% in cooling costs compared to a poorly designed building. This means that if we have a proper orientation of living spaces and windows, with proper ventilation, with well formulated sunscreens, selecting good materials and colors of the walls, installing insulation and using the thermal inertia of the building, we can achieve an environment of comfort, so that no artificial cooling is required, it represents a very costly expense for the purchase of sophisticated equipment and their constant and ongoing maintenance. A good architectural design energically efficient, does not have to be more expensive than a conventional one, it is not necessary to install expensive high-tech systems,but to play with the architectural elements of a natural passive and achieve a good level of comfort and welfare of users at the same time we are participating in the care and improvement of natural environment that we have as an envelope, which we are dependent to. Also being directly responsible for its preservation. According to the above, we must be clear that things have to change toward a more sustainable vision and in that sense all of us involved in the construction sector have a big commitment and there is still much to do in this process of evolution, taking into account that we have the privilege of acting negligible and influence on the environment, modifying it as a direct result of our daily professional work. Autor: Arq. Jorge Alberto Sanchez Angulo. LA VISION DE SUSTENTABILIDAD Y LA ARQUITECTURA. Arq. Jorge Alberto Sanchez Angulo. En la actualidad; todos hemos oído hablar o hemos leído algo, relacionado con el medio ambiente, a través de las voces y letras de muchos entusiastas preocupados sobre el tema, recibiendo posiciones de todo tipo ante lo que se le ha dado por llamar: La problemática ambiental. Todas estas voces nos tratan de orientar en relación a la importancia que tiene nuestra participación en la lucha para la conservación del medio ambiente…¿perooo?… ¿porque tenemos que participar en este tema, si el medio ambiente lo hemos considerado siempre como… “el paisaje natural”, “el bosque”, “el mar”; que son cosas muy bellas, pero que muy poco tienen que ver con nosotros… pues muy poco los frecuentamos ?. No dependemos de ellos, pues ni siquiera vivimos allí. Primeramente; el medio ambiente es un satisfactor intrínseco, pues por el solo hecho de existir, sirve y satisface muchas de las necesidades básicas del hombre y de todos los seres vivos. El agua, el aire y la luz del sol, son algunos de los elementos que lo componen y sin los cuales no podría existir vida alguna sobre la tierra. Además de ser el medio en el que los seres vivos dependemos para vivir, también ha sido un factor de producción, para el desarrollo de la humanidad, pues desde siempre, se ha valido de sus elementos y componentes en interacción para sobrevivir y desarrollarse. Así; el hombre, aprovechó la interacción de la tierra, el aire, las lluvias y los vientos, para crear la agricultura y asegurar su alimentación. Así mismo; ha aprovechado diferentes formas de energía que provee la naturaleza para utilizarlas en su beneficio. El Medio Ambiente también ha sido y es un recurso potencial en forma de materia prima, presentado en forma de: madera, tierra, metales, agua, flora, fauna, etc. que le han servido al hombre para construir, alimentarse y para generar energía o productos de uso diario entre otras muchas cosas prácticas. Es en base a esta interacción entre el Hombre y el Medio Ambiente, que se han construido las estructuras y el funcionamiento de las sociedades, así como las normas de comportamiento de los individuos que las integran, mismas que están en relación directa con la forma en que los seres humanos se relacionan con la naturaleza. Y es esta misma relación, la base de la degradación del Medio Ambiente y de la crisis actual que enfrenta la humanidad. El hombre no ha prestado la debida atención a la preservación y conservación del medio ambiente, pues lo ha considerado como un bien divino, inacabable, inalterable e infinito y en esta idea, ha descuidado, dañado o despilfarrado en su contra. Esta actitud ha llevado al hombre a la crisis ecológica actual y lo ha puesto entre al espada y la pared. Porque si continua en esa misma línea de falta de respeto y continua atentando contra su medio ambiente también terminará de recibir los privilegios que este le provee. Si sigue arrasando y contaminando sus bosques, sus aguas… en fin, todos sus recursos, se ve claro que terminara consigo mismo. Un ejemplo claro de esto es la contaminación a través de gases y deshechos que han dañando de una forma realmente irresponsable la cubierta atmosférica del planeta. El legado que los habitantes de siglo XXI estamos dejando para las generaciones que nos prosiguen no es nada alentador, pues en la actualidad la humanidad ya sufre el grave problema para poder dar satisfactores adecuados a las necesidades de una gran población que cada vez crece más, partiendo de un stock de recursos naturales que se han limitado en mucho, algunos de los cuales son no renovables e insustituibles hasta la fecha, que además de ser relativamente escasos, ya tienen literalmente sus días contados y otros, que siendo renovables y aparentemente abundantes, fueron descuidados, destruyéndolos y contaminándolos sin cuidar jamás su regeneración. Desde su origen, en la revolución industrial, la tecnología ha sido concebida muchas veces como la panacea que lleva al progreso y desarrollo máximo del hombre. Pero en la actualidad la escasez y los costos de la energía, están echando por tierra esta posición tan acrítica, que difunde la propia tecnología para su autogeneración, no toda innovación tecnológica ha sido realmente progreso, muchas veces y en muchas formas la nuevas tecnología ha provocado graves daños a la ecología y al medio ambiente. Los altos niveles de deterioro ambiental que estamos sufriendo actualmente se han dado, en gran parte, bajo la búsqueda del tan cacaraqueado progreso. Entendiéndolo de una forma totalmente equivocada, pues se ha considerado que al progreso solo se puede acceder a través de un intenso crecimiento industrial y avance tecnológico, aunque este haya sido inconsciente en su concepción de la explotación de los recursos físicos y humanos, dando beneficios inequitativos solo a algunos sectores privilegiados de la sociedad. El uso indiscriminado en esta forma de tecnología y de esta manera de pensar ha sido el principal instrumento en la despiadada explotación y sometimiento de la naturaleza y del hombre. LA VISION DEL DESARROLLO SUSTENTABLE..
Desde los años setentas, se plantea por primera vez la idea del Desarrollo Sustentable, iniciando con una visión ambientalista. Y para finales de los ochenta, principios de los noventa y hasta la fecha de hoy, ya no solo se habla de crisis energética si no que ahora se habla de crisis ecológica, misma que quedó evidenciada, cuando basado en el Informe Brundtland ( 1987 ), la Declaración de la Cumbre de Río ( 1992 ) pone de manifiesto que los recursos naturales son limitados y el desarrollo debe de ser “Sostenible”, es decir, debe de ser capaz de satisfacer las necesidades de la generaciones presentes sin comprometer las posibilidades de desarrollo de las generaciones del futuro, para atender sus propias necesidades. Corriente del pensamiento, que al paso de los años ha evolucionado en una nueva visión de desarrollo económico y sociocultural, que toma en cuenta de forma destacada, las necesidades, cualidades, capacidades y oportunidades que presenta el medio local, dándole un énfasis particular a la variable medioambiental. Promueve que las sociedades se organicen en función del uso racional de sus respectivos ecosistemas, los que se valorizan gracias a la adopción de tecnologías adecuadas y lo que supone además, basar el desarrollo en el esfuerzo propio y la recuperación de los valores tradicionales, asumiendo como elemento básico la autodeterminación. El Desarrollo Sustentable promueve un tipo de desarrollo que tenga coherencia con las realidades concretas de cada región, atendiendo los requerimientos y la cultura de sus habitantes, con un uso menos intensivo y más consciente de la realidad de sus recursos para tener un mínimo grado de deterioro ecológico..
La situación antes descrita hace necesario que el hombre tome una nueva actitud y moralidad ecológica, que trae aparejada una revaloración de los recursos naturales y potencialidades del medio ambiente, lo que representa: no despilfarrar, no contaminar, no dañar, ni destruir estos recursos. Si no que representa: Conservarlos, cuidarlos, reproducirlos, propiciar su regeneración, optimizar su aprovechamiento en la satisfacción de sus necesidades reales, basado en la idea de que es necesario de que exista una integración y respeto hacia la naturaleza y el medio ambiente, superando el consumismo y el dispendio indiscriminado de los recursos. En la actualidad todos los países en lo general así como todos y cada uno de nosotros debemos buscar y propiciar el desarrollo de tecnologías que sean coherentes con nuestras necesidades y potencialidades reales, que en vez de generar fuertes impactos depredatorios por un único afán consumista, realmente ayude a conservar y a aprovechar nuestros recursos, de tal manera que restrinjan sus efectos contaminantes sobre el medio ambiente y elimine el lucro como fin absoluto. Es pues natural que con todos estos antecedentes, el término de arquitectura sustentable se haya puesto de moda y se utilice durante los últimos tiempos para referirse a lo que en décadas pasadas se le llamaba “arquitectura bioclimática”, “arquitectura ecológica”, “arquitectura ambiental, “Bioarquitectura”, “arquitectura verde, “Arquitectura solar” y la también llamada “Arquitectura ambientalmente consciente”. Pues en la realidad, la arquitectura sustentable es el modelo más acabado de las diferentes tendencias de la arquitectura Bioambiental, pues estos movimientos son su fundamento. 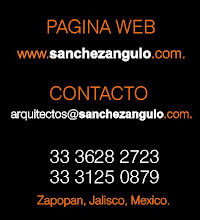 La arquitectura sustentable recoge toda la información previa de estas tendencias y las integra con una nueva visión más integral del impacto ambiental que representa la transformación del medio ambiente natural por el hombre al intervenirlo para hacer sus edificaciones y para desarrollar su vida. Tomando en cuenta que como seres humanos afectamos nuestro medio ambiente, al modificarlo y servirnos de el, debemos de tener conciencia de que debemos de aprender nuevas formas para integrarnos, sin destruirlo, pues de otra manera nos estaremos destruyendo a nosotros mismos. De acuerdo a lo antes planteado, tendremos que comprometernos con el concepto de sustentabilidad, tomando el camino que mas nos convenza, el que mas nos guste o el que mas nos convenga, de acuerdo a nuestras condiciones socioeconómicas y culturales, pero si bajo un serio compromiso. Esta posición se debe de tomar como ser humano común… y como profesional hacedor de la arquitectura y de la edificación también tenemos que estar comprometidos con esta misma idea. En base a todo lo anterior, Arquitectura sustentable es aquella arquitectura cuyo principal objetivo es el de diseñar y construir espacios ecológicamente concebidos, que respondan de manera integral y armónica a la acción de los factores ambientales de su entorno natural, para lograr las óptimas condiciones de confort y bienestar, que propicien el desarrollo integral en la vida de las personas que los habitan. Teniendo la conciencia del máximo respeto e integración a los ciclos vitales de la naturaleza y al medio ambiente, para garantizar su preservación y la disponibilidad del mismo por parte de las futuras generaciones. Hacer Arquitectura sustentable, no se trata únicamente de aplicar recetas preestablecidas, de comprar e instalar las últimas y más caras tecnologías, de evaluar los resultados solamente a partir de un check list de compras. Se trata de que nos comprometamos y hagamos conciencia de nuestras condiciones y requerimientos, físicos, sociales, económicos, culturales, de nuestros propios recursos, capacidades y potencialidades reales de sustentabilidad, para poder tomar los caminos, proponer soluciones, aplicar y desarrollar las tecnologías mas apropiadas a nuestras necesidades y requerimientos concretos. Por lo que No podemos eludir nuestra responsabilidad para participar y aportar nuestro granito de arena, participando activamente en esta nueva forma de ver las cosas, aprendiendo a llevar una nueva forma de vida, de mayor respeto, armonía y sentido común, para valernos de nuestro medio ambiente, sin despilfarros, sin contaminar, sin dañar y sin destruir los recursos naturales, que hasta este momento hemos tenido prestados y que tendremos que entregar, en mejores condiciones que en los que hoy se encuentran, a nuestras siguientes generaciones, ya que estos, son básicos e indispensables, para garantizar su sobrevivencia en este mundo.